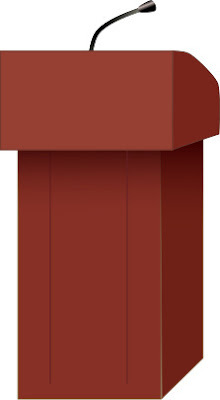 After hearing that Mexico refuses to pay for the building of a fence on the US/Mexico international border, Donald Trump quickly called for a press conference where he would announcing his plan b.
Trump then pauses as he reaches under the podium where he is standing, obviously struggling to grab something underneath. “Say hello to my little…” says Trump in a false start as he pauses again, still struggling with the object. Then judging by the expression on his face, Trump finally grabs hold of whatever it is, lifting it up in the air above his head. “Say hello to my little friend, Claymore,” Trump proudly announces. At first people and members of the media are puzzled by the object held up in the hands of the GOP's leading 2016 presidential candidate. Until a war correspondent recognizes and identifies the object through the viewfinder of his camera lens. Suddenly, people and members of the media begin running for the exits. Photojournalists and cameramen periodically pausing momentarily to take a picture of Donald Trump standing on stage, holding the Claymore mine above his head.